The Soyuz TMA-13 spacecraft seen after landing in Kazakhstan on April 8, 2009 with self-financed space traveler Charles Simonyi aboard. Now his property, Simonyi has loaned the capsule to The Museum of Flight in Seattle, Washington, for display in their new Charles Simonyi Space Gallery. A self-funded space traveler loaned his Russian spacecraft to a museum Thursday (Dec. 8), where it will be exhibited near a full-size mockup of a U.S. space shuttle. The donation was anything but a common occurrence, but it happened to be the second time in less than a month. The Museum of Flight in Seattle hosted the festivities Thursday, where they not only announced that the billionaire architect behind Microsoft Office, Charles Simonyi, would be loaning his Soyuz TMA-13 capsule to them, but that it would be housed in their newly-dedicated "Charles Simonyi Space Gallery." The 15,500 square foot annex will also display a 120-foot-long Full Fuselage Trainer (FFT), a full-size space shuttle, sans wings, that was used for 30 years as a test bed and astronaut trainer. The mockup, like the real shuttle fleet, is now retired, so NASA is transferring it to the museum. The Russian capsule was hoisted on board the converted aircraft carrier for display, just as NASA's prototype space shuttle Enterprise will be when it arrives in Manhattan next year. The display of private astronauts' Soyuz capsules alongside space shuttles is symbolic of the changes that the U.S. space program is currently undergoing. With the retirement of the space shuttle in July, NASA astronauts are relying on the Russian spacecraft to fly them to the space station until U.S. companies can start operating their own commercial launch services over the next several years. American entrepreneur Charles Simonyi peers out of the hatch of a Russian Soyuz spacecraft simulator during prelaunch training for his 13-day flight to the International Space Station. The Museum of Flight named their new space gallery after Simonyi not because he loaned them his Soyuz or because he is local to the Seattle area, nor was it because he donated $3 million toward the $12 million cost to build the facility, museum officials said. "This imposing new Charles Simonyi Space Gallery could not have become a reality without Dr. Simonyi's continued support for the Museum of Flight and his vision about what our future can hold," Museum of Flight president and CEO Doug King said in a statement. "While we are grateful for his monetary contribution, we truly named the gallery in honor of Charles to recognize his commitment to aerospace education and his tireless enthusiasm for inspiring the next generation of space explorers." Simonyi was the fifth person to pay his way to space and the only one to make the self-funded trip twice. He first flew to the space station onboard the Soyuz TMA-10 in April 2007. 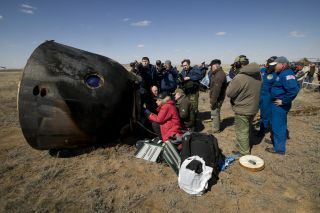 The spacecraft he is loaning, Soyuz TMA-13, brought him back to Earth after his second two-week mission in April 2009. During both his missions, Simonyi reached out to children through his website and by using amateur radio to connect with classrooms. In addition to the capsule, Simonyi is also providing the museum with his spacesuit and a "space toilet," among other memorabilia he kept from his two missions. Those items, together with other space artifacts — including the centerpiece full-scale shuttle trainer — will be used by the museum to exhibit how astronauts train for their missions and how the knowledge gained during the first 50 years of spaceflight has helped prepare for future missions farther into the solar system. "The naming of the space gallery is a great honor for me and for my family," Simonyi said Thursday. "I have the highest regard for the Museum of Flight and now that we are at the threshold of a great expansion of civilian space flight, I fully support the museum's efforts to engage the public on the issue of space exploration with a focus on civilian space: past, present and future." Unlike Simonyi's spacecraft, which is still in Russia — it is scheduled to arrive in Seattle in March in advance of the gallery opening in June — Olsen's Soyuz is already on the Intrepid. The Soyuz TMA-6, which Olsen rode back to Earth after his own self-financed mission in October 2005, arrived on the aircraft carrier on Oct. 18. It was made available for public viewing a month later on Nov. 14. "I hope the exhibit at the Intrepid will not only spotlight the great engineering at the core of Russia's space program, but also inspire kids to pursue their own dreams and to never give up," Olsen said. Whereas the Museum of Flight originally built their gallery to house a flown space shuttle and lost out to other cities, the Intrepid scrapped its plans for a similar new gallery after being awarded the Enterprise in April. Instead, they now plan to display the atmospheric approach and landing test vehicle on its flight deck under a protective covering beginning in the summer of 2012. The Intrepid plans to eventually move Enterprise, and with it maybe Olsen's Soyuz, into a new museum to be built in an empty lot across from where the carrier is berthed.